Product specs, instructions and limited warranty. Specifications, part numbers and detailed information on the AboveGround SPOT-SPITTER. Specifications, part numbers, dimensions and detailed information on Primerus Tubing. 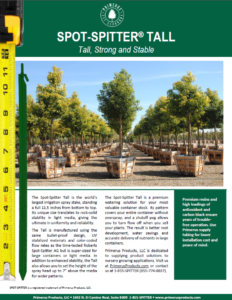 Specifications, part numbers, dimensions and detailed information on SPOT-SPITTER Tall. Instructions on use of the SPOT-SPITTER, Primerus Tubing and the 1/8” Hole Punch for error-free installation. 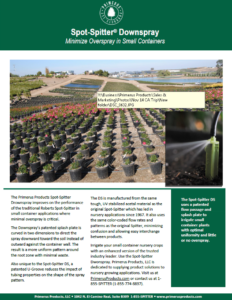 Includes guidelines on maximum number of emitters per lateral. An important primer for first-time SPOT-SPITTER users. Limited Warranty for all Primerus Products. Spot-Spitter design calculator spreadsheet in Excel.